I’ve been covering technology for several years for web sites including Download Squad and Liliputing. And I’ve been filing radio news reports on topics ranging from politics to the environment for about 8 years. But one of my first radio stories about technology ran this afternoon as part of a new tech segment on NPR’s All Things Considered called All Tech Considered. The story is about Yammer, a social networking and communication tool that looks and feels a lot like Twitter. The difference is that Yammer is designed for communicating with your coworkers, not the whole world. In order to talk to someone on Yammer, you need to share an email domain. In other words, jack@jack.com could talk to joe@jack.com. But he wouldn’t be able to communicate with joe@joejackson.com. There are a lot of neat things about Yammer that I didn’t have time to cram into the story. For example, because it has a freemium model, Yammer users sort of act as the company’s salesforce. Here’s how it works. Anyone can sign up and create a network for their business for free. If a CEO or IT administrator sees that 5, 10, or 100 employees are using Yammer, they can pay for an administrator account which costs $1 per user per month. But if you don’t need administrator privileges, you never have to pay. Like Twitter, you can access Yammer on the web, through a mobile phone application, by email, or using a desktop application that feels a lot like an instant messenger. 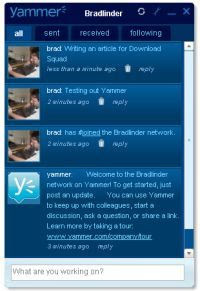 I first wrote about Yammer for Download Squad a few months ago. When I heard that NPR was looking for a story about social networking in the workplace, it seemed like a natural fit. So I arranged an interview with Yammer CEO David Sacks in Los Angeles and tracked down a company in suburban Philadelphia that was starting to use Yammer for inter-office communication. The story I filed got cut down a bit for size, but I think it still gets the point across pretty well. Social networking tools can be a huge waste of time in the workplace. But they can also save you time and potentially increase productivity if used properly. You can read the story at NPR’s web site, and the audio will be posted online later this afternoon. We’re a college startup where you can find any listen to any song online for free. And we’re a Yammer company as well, it’s great they have all of the requisite Blackberry and iPhone apps already built. We're a college startup where you can find any listen to any song online for free. And we're a Yammer company as well, it's great they have all of the requisite Blackberry and iPhone apps already built.